Cutters for a milling machine. 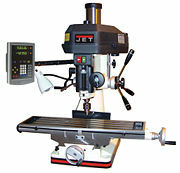 A milling machine is a power-driven machine used for the complex shaping of metal (or possibly other materials) parts. Its basic form is that of a rotating cutter or endmill which rotates about the spindle axis (similar to a drill), and a movable table to which the workpiece is affixed. That is to say the cutting tool generally remains stationary (except for its rotation) while the workpiece moves to accomplish the cutting action. Milling machines may be operated manually or under computer numerical control (CNC). Milling machines can perform a vast number of complex operations, such as slot cutting, planing, drilling, rebating, routing, etc. Cutting fluid is often pumped to the cutting site to cool and lubricate the cut, and to sluice away the resulting swarf. There are two main types of mill—the vertical mill and the horizontal mill. In the vertical mill the spindle axis is vertically oriented. Milling cutters are held in the spindle and rotate on its axis. The spindle can generally be extended (or the table can be raised/lowered, giving the same effect), allowing plunge cuts and drilling. There are several subcategories of vertical mills—the bedmill and the turret mill. Turret mills, like the prevalent Bridgeport, are generally smaller than bedmills, and are considered by some to be more versatile. In a turret mill the spindle remains stationary during cutting operations and the table is moved both perpendicular to and parallel to the spindle axis to accomplish cutting. In the bedmill, however, the table moves only perpendicular to the spindle's axis, while the spindle itself moves parallel to its own axis. Also of note is a lighter machine, called a mill-drill. It is quite popular with hobbyists, due to its inexpensive price. These are frequently of lower quality than other types of machines, however. A horizontal mill has the same sort of x–y table, but the cutters are mounted on a horizontal arbor across the table. A majority of horizontal mills also feature a +15/-15 degree rotary table that allows milling at shallow angles. While endmills and the other types of tools available to a vertical mill may be used in a horizontal mill, their real advantage lies in arbor-mounted cutters, called side and face mills, which have a cross section rather like a circular saw, but are generally wider and smaller in diameter. Because the cutters have good support from the arbor, quite heavy cuts can be taken, enabling rapid material removal rates. These are used to mill grooves and slots. Plain mills are used to shape flat surfaces. Several cutters may be ganged together on the arbor to mill a complex shape of slots and planes. Special cutters can also cut grooves, bevels, radii, or indeed any section desired. These specialty cutters tend to be expensive. Simplex mills have one spindle, and duplex mills have two. It is also easier to cut gears on a horizontal mill. A more complex form of the milling machine is the Universal milling machine, in which the rotating cutter can be oriented vertically or horizontally, increasing the flexibility of the machine tool. The table of the universal machine can be swiveled through a small angle (up to about 15 degrees), enabling tapered cuts to be made over the length of the table. Box or column mills are very basic hobbyist bench-mounted milling machines that feature a head riding up and down on a column or box way. Turret or Vertical ram mills are more commonly referred to as bridgeport-type milling machines. The spindle can be aligned in many different positions for a very versatile, if somewhat less rigid machine. C-Frame mills are larger, industrial production mills. They feature a knee and fixed spindle head that is only mobile vertically. They are typically much more powerful than a turret mill, featuring a separate hydraulic motor for integral hydraulic power feeds in all directions, and a twenty to fifty horsepower motor. Backlash eliminators are almost standard equipment. They use large NMTB 40 or 50 tooling. The tables on C-frame mills are usually 18" by 68" or larger, to allow multiple parts to be machined at the same time. Knee mill refers to any milling machine that has a vertically adjustable table. Bed mill refers to any milling machine where the spindle is on a pendant that moves up and down to move the cutter into the work. These are generally more rigid than a knee mill. Jig borers are vertical mills that are built to bore holes, and very light slot or face milling. They are typically bed mills with a long spindle throw. The beds are more accurate, and the handwheels are graduated down to .0001" for precise hole placement. Horizontal boring mills are large, accurate bed horizontal mills that incorporate many features from various machine tools. They are predominantly used to create large manufacturing jigs, or to modify large, high precision parts. They have a spindle stroke of several (usually between four and six) feet, and many are equipped with a tailstock to perform very long boring operations without losing accuracy as the bore increases in depth. A typical bed would have X and Y travel, and be between three and four feet square with a rotary table or a larger rectangle without said table. The pendant usually has between four and eight feet in vertical movement. Some mills have a large (30" or more) intergal facing head. Right angle rotary tables and vertical milling attachments are available to further increase productivity. Floor mills have a row of rotary tables, and a horizontal pendant spindle mounted on a set of tracks that runs parallel to the table row. These mills have predominantly been converted to CNC, but some can still be found (if one can even find a used machine available) under manual control. The spindle carriage moves to each individual table, performs the machining operations, and moves to the next table while the previous table is being set up for the next operation. Unlike any other kind of mill, floor mills have floor units that are entirely movable. A crane will drop massive rotary tables, X-Y tables, and the like into position for machining, allowing the largest and most complex custom milling operations to take place. 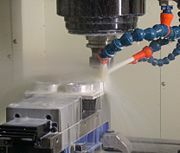 Most CNC milling machines or machining centers are computer controlled vertical mills with the ability to move the spindle vertically along the Z-axis. This extra degree of freedom permits their use in engraving applications, and also allows to create 2.5D surfaces such as relief sculptures. When combined with the use of conical tools or a ball nose cutter, it also significantly improves milling precision without impacting speed, providing a cost-efficient alternative to most flat-surface hand-engraving work. CNC machines can exist in virtually any of the forms of manual machinery, like horizontal mills. The most advanced CNC milling-machines, the five-axis machines, add two more axes in addition to the three normal axes (XYZ). Horizontal milling machines also have a C or Q axis, allowing the horizontally mounted workpiece to be rotated, essentially allowing asymmetric and eccentric turning. The fifth axis (B-Axis) controls the tilt of the tool itself. When all of these axes are used in conjunction with each other, extremely complicated geometries, even organic geometries such as a human head can be made with relative ease with these machines. But the skill to program such geometries is beyond that of most humans. Therefore, five-axis milling machines are practically always programmed with CAM. There is some degree of standardization of the tooling used with CNC Milling Machines and to a much lesser degree with manual milling machines. CNC Milling machines will nearly always use CAT, BT or HSK tooling. CAT tooling, sometimes called V-Flange Tooling, is the oldest variation and is probably still the most common. CAT tooling was invented by Caterpillar Inc. of Peoria, Illinois in order to standardize the tooling used on their machinery. CAT tooling comes in a range of sizes designated as CAT-30, CAT-40, CAT-50, etc. The number refers to the NMTB Taper size of the tool. HSK tooling, sometimes called "Hollow Shank Tooling," is much more common in Europe where it was invented than it is in the United States. It is claimed that HSK tooling is even better than BT Tooling at high speeds. 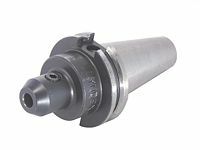 The holding mechanism for HSK tooling is placed within the (hollow) body of the tool and, as spindle speed increases, it expands, gripping the tool more tightly with increasing spindle speed. There is no pull stud with this type of tooling. The situation is quite different for manual milling machines—there is little standardization. Newer and larger manual machines usually use NMTB tooling. This tooling is somewhat similar to CAT tooling but requires a drawbar within the milling machine. Furthermore, there are a number of variations with NMTB tooling that make interchangeability troublesome. Two other tool holding systems for manual machines are worthy of note—the R8 collet and the Morse Taper number 2 collet. Bridgeport Machines of Bridgeport Connecticut so dominated the milling machine market for such a long time that their machine "The Bridgeport" is virtually synonymous with "Manual milling machine." The bulk of the machines that Bridgeport made from about 1965 onward used an R8 collet system. Prior to that, the bulk of the machines used a Morse Taper number 2 collet system. As an historical footnote—Bridgeport is now owned by Hardinge Brothers of Elmira, New York. This page was last modified on 2 April 2008, at 12:22.